Another successful installation by Atrium Gantrys Maintenance Limited. In this case a screw jack platform BMU hoist fully designed and built in house to raise and lower the BMU and cradle weighing in excess of 6 tonnes one complete storey for parking the machine off the main roof and to access the façade of the lower building from the lower track system. One special feature the BMU incorporated is an electronic zone controller which was fully designed and built in house by our Electrical Engineers. 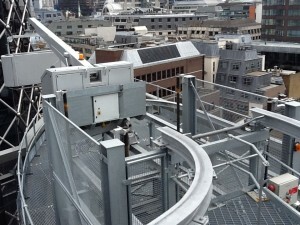 This Controller limited the functions of the machine to only carry out specific movements in designated zones around the building thus preventing the BMU coming into contact with the neighbouring building or external structural steelwork and to limit functions whilst the BMU was being raised or lowered on the Hoist. The equipment supplied also included 4 no. power traversed special Beam Gantrys to suspend a power winch Cradle to access the vertical walls below. Atrium Gantrys are extremely proud to have been associated with this project and be able to demonstrate our engineering expertise. This entry was posted in Projects by tim. Bookmark the permalink.